ENIGMA (2001, directed by Michael Apted, screenplay by Tom Stoppard, based on the novel by Robert Harris). There is a contradiction at the heart of any work of fiction, especially avowedly 'historical fiction': falsity has somehow to be grafted on to truth. Nothing can satisfactorily resolve this logical impossibility: without falsity the work is not fiction; without an element of truth it is not historical. We must somehow suspend belief for the fiction, yet at the same time give credence to its historical 'accuracy.' The political writer and novelist Robert Harris is alive to such questions, and when writing his fiction Enigma, (Hutchinson, London, 1995), set amidst the World War II codebreaking work at Bletchley Park, made a thoughtful choice of the period in early 1943. Others might have tried to latch on to more famous moments in war history, but Harris deliberately set his work in the unglamorous but critical period of the Atlantic war. This self-denying setting also had another advantage. A story set in the early period of the war could not have avoided the unique and central figure of Alan Turing. He devised the British Bombe to break Enigma-enciphered messages by the mechanisation of a complex chain of logical deductions based in guessed plaintext. He also made in 1939 the single-handed break into Naval Enigma material. To 'fictionalise' this would be as gross as 'fictionalising' Churchill. But by 1943, use of the Bombe was routine, Turing was in America, and there were other hands at work on U-boat messages, so that interposing a fictional character into the story did not make so obvious a contradiction with history of the war and the history of mathematics. Harris recognised this by putting into his novel 'the great Alan Turing' with a few awkward spoken lines ('I'm researching Riemann') which conveyed that he was the early figure in British Enigma-breaking. The fictional mathematician Tom Jericho, Harris's lead character, was clearly distinct. This sensitivity has been abandoned by director Michael Apted and writer Tom Stoppard in the film based on Harris's book. They have also jettisoned the efforts by Harris to convey some sense of a mathematician's background and outlook, for instance by labouring the concept of 'proof' with some quotations from G. H. Hardy. Instead, they have thoughtlessly and pointlessly invested the fictional hero with feeble references of Turing's work and ideas. At one point, some pages on 'the Entscheidungsproblem' fall out of Tom Jericho's pocket, as something to do with 'theoretical machines' he is thinking about. Jericho is also vaguely credited with devising the Bombe. This is also referred to as a 'thinking machine,' thus alluding to Turing's pioneering ideas on Artificial Intelligence. The PR puffs put out by the production company further confuse the issue by referring to Turing's work and his role as founder of modern computer science. The intention seems to be to latch on to Turing's fame and importance to boost publicity for the film, yet to eliminate the inconvenient Turing from the story told in the film itself. It also leaves viewers with the suggestion that in some way Jericho is 'really' Turing, which if anything is even more offensive, given that he has a completely different personality. In particular, Jericho's story is a rip-roaring heterosexual drama with much jealous, violent action and a femme fatale, as different from Turing's world as it is possible to imagine. (Alan Turing was a shy gay man who at this point in 1943 was on the verge of full self-acceptance and a very modern-minded attitude of self-disclosure). An underlying assumption is perhaps that the world of science and mathematics is fair game for grave-robbing in a way that would not be countenanced in politics or literature; that all mathematics, science and engineering is a grey blur of people whose incomprehensible lives and ideas can be regarded as interchangeable. Instead of dramatising intellectual discovery, as Harris made some effort to do, the film has played up the spy-thriller elements that made his novel a 'best-seller'. If you want to see a mathematician in country-lane car chases, then swimming fully-clothed in a heavy sea, while shooting a pistol at a spying colleague trying to reach a surfacing U-boat, then you should see this film. The best I can say is that it pays faithful homage to Graham Greene's 1943 atmospherics. A deeper problem is that throughout the film, the codebreakers appear as browbeaten by spymasters in the Secret Intelligence Service, and that betrayal of material to Germany is pivotal to the plot. In fact, spying played very little role in the Anglo-American war with Germany (though no doubt it was more significant in relations with the Soviet Union): cryptanalytic intelligence, obtained through scientific ingenuity and organisation, was all-important. The problem lay not in treachery but in implementation: successful use of the intelligence would tend to give it away. The British success largely continued because the German command were quicker to suspect treachery on their side, in reality non-existent, than to doubt the efficacy of the Enigma machine. There are passages in the film where the radicalism of the scientific revolution is made clear enough: the resentment at the 'swots' suddenly being 'stars,' the amused contempt of the codebreakers for irrelevant brass-hat pep-talks. There is also a fine passage where Jericho quickly calculates on information-theoretic grounds whether the coming convoy clash will supply enough material to break back into the U-boat Enigma. But these are disconnected exceptions to the overall emphasis on a traditional war-story plot. The plot is particularly unfair to the Polish heritage. In one line it is stated that the Polish 'cypher bureau' had supplied an Enigma machine at the outset of the war: this greatly understates the brilliance of the Polish pre-war mathematical work. After that it gets worse: the silent Pole amongst the codebreakers (already a severe distortion of the reality at Bletchley Park) is credited with having betrayed the significance of the weather report code book to Germany, and then with intending to give away the entire thing. In fact the Polish analysts never betrayed anything about the Enigma, despite the pressures of captivity, and it is they who could justly feel betrayed in 1945. Again there is an irony here; for Harris has done well to find a pivot for the plot, the discovery of the Katyn massacre (the mass murder of Polish officers by the Soviet Union after the 1939 partition of Poland), which encapsulates all that was sickening in the post-1941 alliance. Furthermore it could well be said that the film does a fine job of integrating this into the plot rather than leaving it as an acute moral symbol (compare the Stalingrad 'Sword of Honour' in Evelyn Waugh's trilogy of that name). Its neat (perhaps over-neat) plotted connection of the Atlantic war with Polish and American issues gives a vivid picture of the emergent globalism of the modern technological world, something to be contrasted favourably with the British drawing-room class-conflict genre. Nevertheless, in building a fiction of Polish betrayal this film has done an injury. The best that can be said is perhaps, as a letter-writer to the Independent suggested, that it introduces the question of Katyn to audiences who are not likely to have heard of it. Indeed the plot turns on understanding the significance of the discovery of the bodies under German occupation. This illustrates the fact that this film is by no means dumbed-down in its expectations of the audience's political knowledge; one must remember that American teenagers, who are the prime audience for film productions, generally do not know even that Germany was the enemy of America in World War II. For this very reason, however, those who see the film are liable to assume that the material is all well-founded, and thereby give all the more credence to its distortions — in particular, returning to the theme I know most personally, the disgraceful exploitation yet elimination of Alan Turing, and behind this, a certain contempt for intellectual history. Some people may think that it is valuable to have a film which illustrates morsels of mathematical work. I certainly cannot take an absolutist view, having acceded in the production of 'Breaking the Code' out of my biography of Alan Turing. But I am inclined to conclude that in the dangerous and basically impossible task of welding fiction and fact, it is essential to keep some basic grip on authenticity in thought and ideas. Props and technical details can be brilliantly lit while still shedding darkness on central truths. Peter Bradshaw's review in The Guardian, 22 February 2002, of the equally contentious film A Beautiful Mind made a similar point about Alan Turing's sexuality. This drew forth a letter from Robert Harris on 23 February, stating that in his novel the hero Jericho was 'never meant to resemble' Turing, but failing to address the merging of identities through allusions in the film. My criticism of the Enigma film has been quoted in an article in the on-line Spiegel by Michael Lenz. My review was also quoted in another controversy, this time in gay.com, about the sculpture of Alan Turing installed at Bletchley Park in 2007. 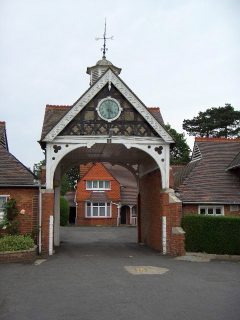 The real Bletchley Park: the entrance to the stables where Alan Turing worked on the real Enigma in 1940 (photo taken 2006).